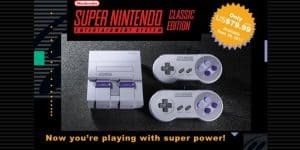 SNES Mini Coming September 2017 | Nerd Much? Nintendo has announced the SNES Mini classic edition, which comes with 21 pre-installed games (listed below) and can be easily plugged into any TV with the included HDMI cable. The SNES Mini will sell for about $79.99 and will have said HDMI cable, along with a USB charging cable, and two wired SNES controllers. Two controllers that allow for the multiplayer feature of some of the included games, like Street Fighter and Mario Kart. Just plug in and start playing your friends, it’s as easy as that. Launching September 29, 2017, the SNES Mini will allow “many of our younger fans” to have a chance at playing all the classic games, as stated by Nintendo of America’s senior vice president of sales and Marketing Doug Bowser. (Wait, is there a relation here to Mario’s evil rival?) Bowser goes on to say that there is nothing quite like longtime fans of these older games sharing them with a brand new audience. The SNES provides the perfect opportunity to hand down the classics without spending way too much a very old console that might not even work. It’s definitely the multiplayer part that sells this relaunch of the SNES, though Nintendo did not mention if more than two could play at once. However, there are plenty of RPGs on the list, like EarthBound, that will take up plenty of time for any player that is a fan of the classic games. The list also includes the never before released Star Fox 2, which will only unlock after you’ve played the first level of the original Star Fox game. So there’s even something brand new to enjoy for the longtime fans.